Sport climbing skills - How to thread the anchor point? Today let’s talk about threading an anchor point on sport climbing route. 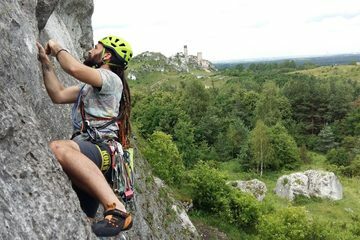 Sport climbing is great and simple but cleaning the anchors, in other words, thread your rope through the rings or chains at the top is potentially dangerous because you have to untie from your harness and re-tie after threading – mistakes happen. Clip your short quickdraw to one of the bolt (higher one). Get longer quickdraw and clip one snapgate binner to your belay loop and bring yourself up and clip second snapgate binner to the ring. Load the system – sit and relax in your harness 🙂 your long quickdraw should be tight! Shout “SAFE” – your partner should now give you lot of slack but still, hold you in the belay device. Pull the rope and make a bight, thread this bight through the ring. Tie a knot a figure of eight on the bight and clip this to your belay loop with spare screwgate binner under your long quickdraw. Now you can untie your original figure of eight form harness. Check the system and shout “ON BELAY” – your partner should take all the slack rope. If you feel your partner is holding you them great! You can unclip short quickdraw and the long quickdraw. Also, you can learn it all by joining one of my climbing courses in Poland.